The colors shown will not be an exact representation of the colors North Star offers due to variations in computer monitors. Click on colors below to see larger image. * Denotes Energy Star approved color. Dura-Star colors contain a minimum of 70% or Hylar 5000 base resin with ceramic pigments. All standards are formulated to ensure consistent color and quality. 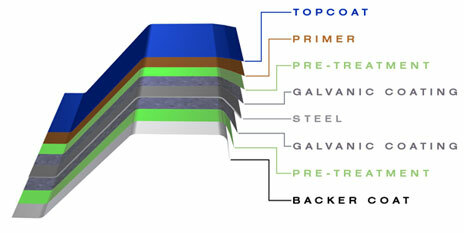 The Kynar/Hylar system is applied over a polyster primer that is applied to a pre-treated galvanic coating, either Galvanized or Galvalume. All topcoats are a minimum of 0.8 mil thick in color of your choice. Superior two coat system that protects against damaging UV rays. Resists general air pollution and will not pit or whiten when exposed to moist environments such as rain, dew, fog, acid rain and chlorinated air. Residential engery tax credit of up to $500 for Energy Star Qualified colors.